Sern is an elderly man who will show up in Dayspring Canyon during the quest Beyond Death. He came to Fort Dawnguard for protection from vampires, but the Dawnguard won't let him or the other refugees inside. Sern will spend all of his time sitting on the log outside of Fort Dawnguard. As long as he isn't bothered, he will never move from this spot. Sern wears a set of clothes and a pair of boots. Besides these basic articles of clothing, Sern carries nothing. 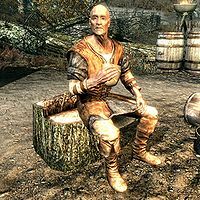 Sern will greet you with numerous comments about how the Dawnguard will not allow them any further within their territory:"Aren't the Dawnguard here to help, to make it safe for us? Can't see why they wouldn't let us in." "I won't beg for protection, but I'm not even sure that would work with this Isran." "How hard would it be to feed a few extra mouths? I'm sure they can manage, and not leave us sitting out here like cattle." "Thought I'd come here to be safe. Now they won't so much as let us in." Strangely, Sern lacks any kind of schedule. He will simply idle on the log where he was put. This issue has been addressed by version 1.2.3 of the Unofficial Dawnguard Patch; he has been given a default sandbox package.